If you’ve been handling the bulk of the workload in your business for some time, outsourcing to a Virtual Assistant can feel like a huge change. However much you might need the help, it can be scary to put your trust in someone else and open your business up to a little bit of risk. And, despite being a Virtual Assistant myself, I say risk because there is risk involved. What if outsourcing to a Virtual Assistant isn’t the right move for you? What if you spend money, time and effort on a Virtual Assistant who doesn’t deliver? Or, perhaps worse still, what if you fail to delegate effectively and the time you’re paying your VA for isn’t well spent? 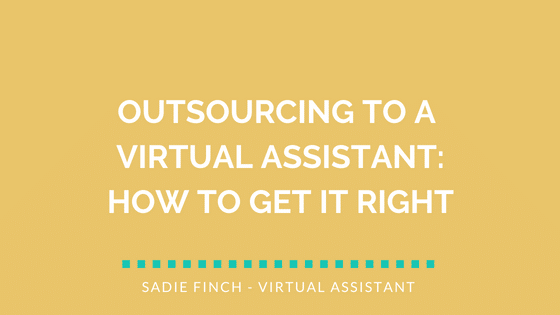 In this post, I’m going to answer some of your common concerns around outsourcing to a Virtual Assistant. I’ll also provide you with a tactical exercise to help you put your VA to work in the most effective way. Is outsourcing to a Virtual Assistant right for me? One of the biggest concerns many small business owners have is cost. Can I afford to hire someone? How can I justify paying someone else when I’m barely making enough myself? There’ll usually come a point in the first 1 or 2 years of business where the workload gets too much. No matter how efficient or productive the owner is, the work mounts, the pressure builds, and the owner becomes stressed, overworked and close to burnout. I know this because I hear the same story from my clients all the time. I know this because I’ve been there myself. This isn’t what we hoped for when we took the leap into self-employment. We knew there’d be a lot of hard work involved, sure, but we hoped for more freedom than this. And a better pay off at the end of each month. So how do you achieve that? How do you get to a point where you’re financially satisfied with your business and you’re getting the balance right? Well, you achieve it with systems, processes, and automation. You find ways of doing more in less time. You plan better, you set boundaries, you focus on your goals, and you seek support in the areas you need it. Any VA who’s worth having on board will understand all of this, and they’ll actively look for ways to tighten up your ship from the moment you start working together. Once you get those systems in place, the free time you’ll create in your day will allow you to focus more on the things that matter: the steps you’re going to take to drive your business forward. One quick technique to help you identify what to outsource is to make a list of the tasks you loathe, like and love. Chances are you’ll probably spend more time on the tasks you don’t enjoy, even if they’re easy or familiar. By outsourcing to a virtual assistant, you could free yourself from those responsibilities and create more time to focus on clients or marketing, for example. If you want to take this exercise a step further and incorporate it into a strategic business plan, you might prefer to carry out a SWOT analysis. What are my strengths? What am I good at, what do I often get praised for, and what do I feel confident about? What opportunities do I have? What plans do I have to move my business forward, and what resources (including people) can I utilise? What are my weaknesses? What do I struggle with, what criticism have I received in the past, and what do I often put off? What threats does my business face? What are the worst case scenarios, and where could things go wrong if I’m not in control of the details? (e.g. insurance, tax, and licensing issues). 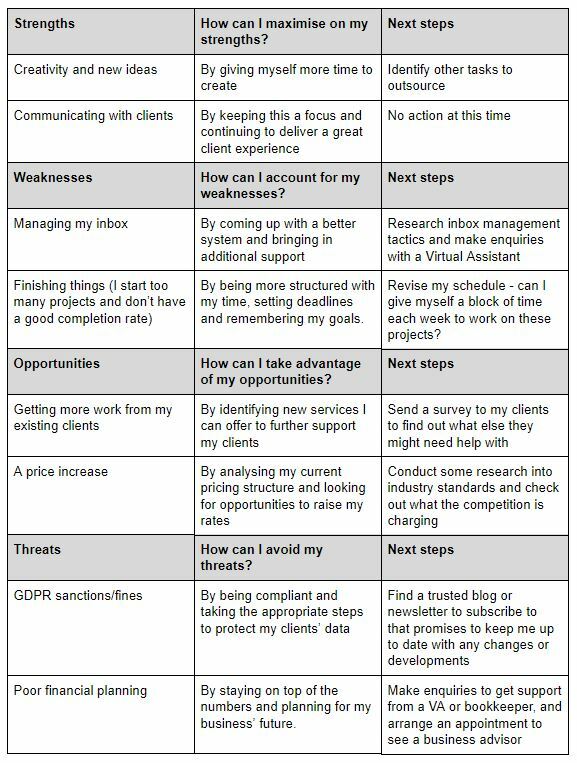 Creating a SWOT analysis should be an insightful exercise, but it’s what you do with it next that really counts. Take your notes and type them into a table in Word or Google Docs. You’ll need three columns. Use the first to enter the notes you’ve just made, each in their own row under the appropriate subheading. How can I maximise on my strengths? How can I account for my weaknesses? How can I take advantage of my opportunities? How can I avoid my threats? In the third column, assign yourself tasks, where relevant, to show what action you’ll take next. You will then have a list of action points you can follow as you move forward. Put them in priority order and start working your way through the list. Remember to ask for help where you need it. There may be some clear options for outsourcing to a virtual assistant based on what your weaknesses and threats are. Alternatively (or as well as that) you may need to seek further advice and support to help you take advantage of your strengths and opportunities. Having someone to bounce ideas around with can make all the difference in business. Sadly it’s an opportunity that many small business owners don’t get. A Virtual Assistant can act as a soundboard for you. The more they get to know your business, the more input they’ll be able to give in these discussions. No two VAs are the same, just as no two businesses are the same. Depending on where your own strengths lie and which tasks you’ve decided to outsource, you’ll need to find a VA that’s got the skills to fill in your blanks. And that’s not your only challenge – you’ll need to find someone you can trust and get on well with, too. Don’t just go with the first VA you come across. Do your research and identify two or three VAs that have the skills and experience you’re looking for. Make an initial enquiry with each of them and ask yourself the following questions: How well do they communicate? How much interest do they show in my business? Do they offer good value for money? Give them each a test task to see how well they perform. Are they good at spotting details, working independently, and producing quality work? From there you can make your decision. Hopefully, you’ll be on the path towards building a more balanced, sustainable and successful business. Should you need any additional support in your search to find the right VA for you, don’t hesitate to get in touch. Whether or not I offer the services you’re looking for, I’ve built up a strong network of other VAs over the past couple of years, so I can probably point you in the right direction. Email me at sadie@sadiefinch.com or call me on 07468 567419 to arrange a free consultation.